It's always great to get good news ! Noted .Thanks Cal.When it comes to animal welfare Taiwan far surpasses its big brother across the water and does not have the same culture of animal cruelty ,and by the same token the same extent of human rights abuses. Taiwan is a democracy where people can live without fear of repression if they criticize the government.China could learn a lot from its little neighbour . I could never envision the two countries ever uniting ,their political systems are completely different. Great news!! Turtles need all the help they can get. Well done. I like to hear some good news before my day starts. Thank you. Thanks Cal - cross-posted - always look for nice news since the petitions are so horrible. Terrific news , thanks . It's great to read something good for both animals and the world. Kudos to all involved in this wonderful endeavor. Yay! It's always good to hear some positive news. 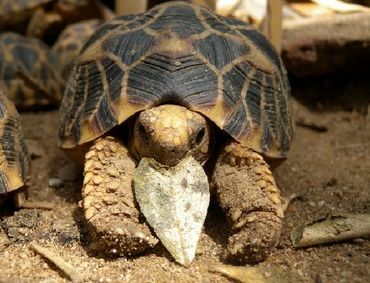 The Burmese Star Tortoise is a very rare kind.Bravo! We must restore Native Habitats so that no being will be reduced to subsisting in an artificial environment . NATURE RULES! I agree with Yvette. I think it is even more to conserve enough natural habitats in the first place, so that restoration is not needed. The funding noted above sounds nice, although small. Thanks Cal for sharing this great news. Great news. Thank you Cal.